A native of Little Rock, Jordan joined the Arkansas Symphony Orchestra bass section in 2004. He completed his undergraduate musical studies at the University of Central Arkansas, earning his Bachelor’s Degree in Music Performance in 2009. While at UCA, he also earned his teaching certification in instrumental music and studied orchestral conducting with Maestro Israel Getzov. 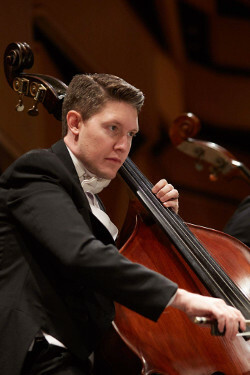 He has studied double bass under the instruction of James Hatch, Joe Cripps, John Dahlstrand and John Chiego. Along with concerts throughout Arkansas with the ASO, Jordan has also performed extensively with the Fujian Province Symphony Orchestra in Fuzhou, China. From 2003-2009, Jordan held the position of Associate Principal Bass of the Conway Symphony Orchestra. Other musical collaborations include performances with the Hot Springs Music Festival Orchestra, Pine Bluff Symphony Orchestra, South Arkansas Symphony Orchestra, and many other regional ensembles statewide. In 2015, Jordan completed a Masters of Health Administration from the University of Arkansas for Medical Sciences. He currently works full-time at Arkansas Children’s Hospital and is an active member of the American College of Healthcare Executives. When not working or performing, Jordan enjoys spending time with his wife, Katie, and two daughters, Harper and Charlotte.